“I’m Kaser Najjar, a refugee from Aleppo, city of fun and music in Syria. 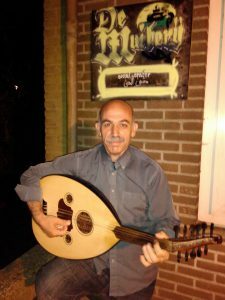 I play Oud, an instrument that looks a bit like a guitar with a bended head. I arrived in Amsterdam 10 months ago and stayed in the AZC Flierbosdreef. There I made music with a lot of people. When they organized the ‘Flierbos got talent’ in the Parktheater in the Bijlmer we made it to the first prize. You can see it in the video. I also played in the Bimhuis, Muziekgebouw aan het IJ.